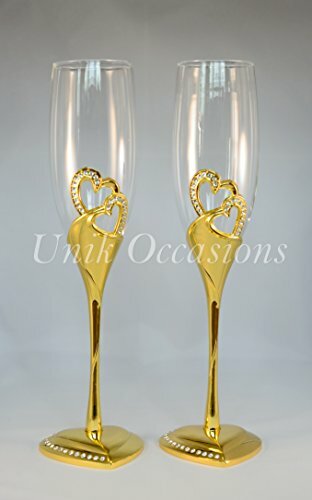 The best unique wedding champagne flutes are a special set of glasses for a Bride and Groom to enjoy for a toast at their wedding or to enjoy at home. 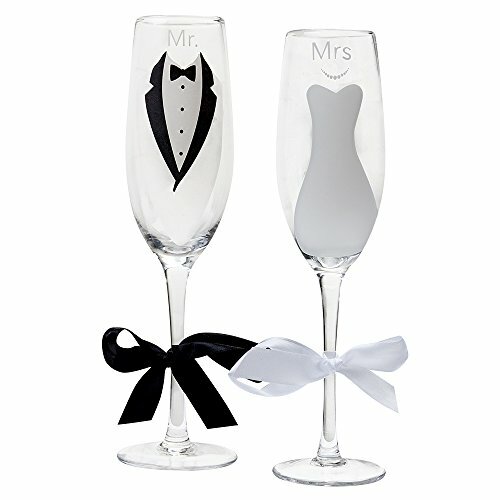 A Bride and Groom needs a special set of toasting wedding glasses for their wedding and to cherish beyond. There are so many choices and sometimes it can be overwhelming to find that perfect set of wedding couple glasses. This special list brings together the top choices for the bride and groom and features something for everyone. 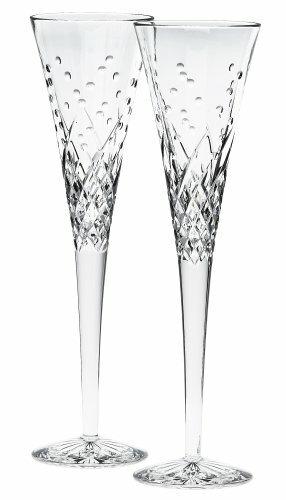 A perfect pair of crystal unique wedding champagne flutes, richly designed and a beautiful addition that the bride and groom will adore. These gorgeous glasses are expertly made with a pattern of bubbles for a champagne match made in heaven. Very classic, beautiful and traditional with a modern flair. These champagne glasses gift set are the cat’s pajamas of toasting flutes. If you are looking for the most elegant set of glasses for the bride and groom, these are just gorgeous. Give these lovely glasses for a wedding shower, a wedding gift or the bride and groom may want to purchase these to use for that special toast at the wedding reception. Not just a keepsake, but a glass set with sweet remembrances. The happy couple can enjoy these glasses again for anniversaries, holidays and many special occasions. Stylish with a bit of classic and also contemporary design make this champagne set stunning. The wedding flutes cannot stand alone from the heart and both flutes need to be in place so the heart is one. Not only is this set beautiful, but full of sentiment and perfect for a bride and groom. A beautiful addition to the bride and groom’s table so they can enjoy their champagne toast in sophisticated style. Perfect for a wedding shower gift or early wedding gift. Delicately detailed with exquisite interlocking hearts in a silver plated base, these beautiful flutes are a perfect gift for newlyweds. 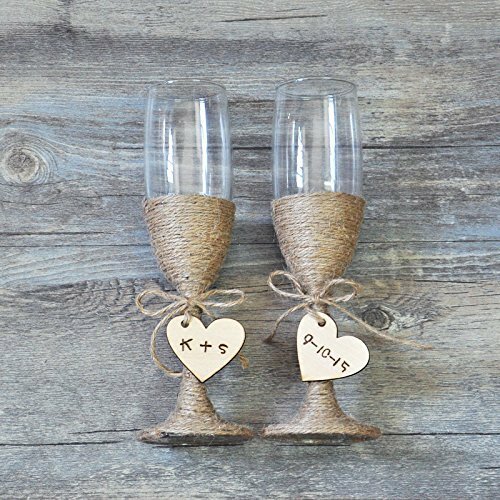 Looking for a pair of rustic wedding flutes? Choose this favorite country wedding gift. The sweetest bride and groom glasses made country style just for an outdoor or country themed wedding. Glasses are wrapped in twine with wooden hearts, hand engraved with couples initials and wedding date. These glasses are handmade and custom ordered, so allow extra time to receive your order. 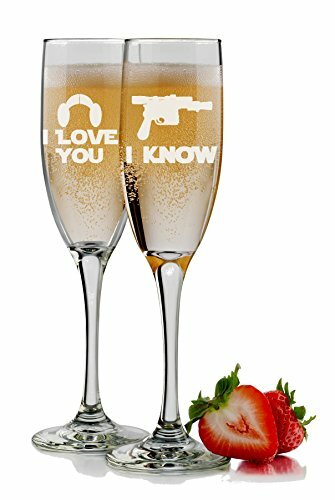 If you know a couple that loves Star Wars and especially if they like to recite the movie lines, this is the gift for them! 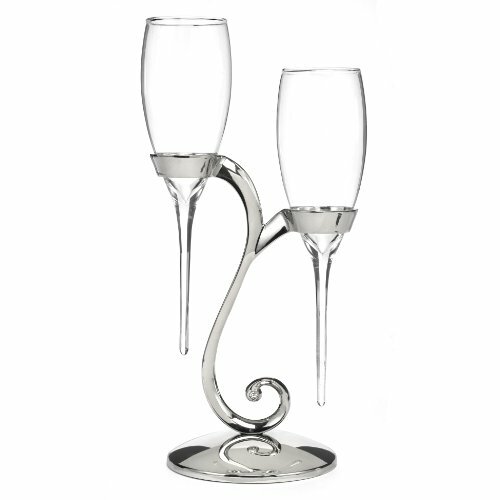 These sleek wedding flutes are great for toasting at the wedding and for future anniversaries. A thoughtful gift for not only weddings, but anniversaries, Valentine’s Day and Christmas. Treat the bride and groom to the luxury of custom engraved glasses. To add something special to toasting wedding glasses, a personal touch is in order. This lovely selection of glasses offers unique engraving for the bride and groom. Since these are custom made, please order early for a timely delivery. Add a touch of romance as Mr. and Mrs. toast to their future. Gold and rhinestones are a magic combination when it comes to weddings. A bride and groom that have a gold theme will love these elegant toasting wedding glasses. The detail is gorgeous and the heart bases are truly unique. All of these flutes are so cute! I have to say I especially live the Star Wars ones though! If I wasn’t already married, I would so use them.. and may have to buy some just because! All these flutes are lovely, but my favorites are the crystal flutes. They’re both modern and traditional and love the elegant manufacturing. Love these! All so adorable! The rustic ones would have worked great with my wedding. These are all so pretty! We got some Titanic flutes since we got our vows renewed in the Titanic museum. They’re pretty cool! These are so beautiful! If I ever get around to planning my wedding I will definitely use this guide. Wow! This is such a great post, loved the ideas. I like the Grand Toasting Flutes it’s for me the perfect for such a wonderful occasion. Wow these are all so beautiful! My favourite set would have to be the Glass and Silver Interlocking Heart as it is modern yet classic. These flutes look so elegant! I particularly like the first one. These flutes are all gorgeous! loving the designs! so original and unique! I love wedding season. These are some sweet champagne flutes to give as gifts. What a unique idea to have a special set of toast glasses for the bride and groom to cherish. We had such a small wedding 20 years ago, we missed out on this. Oh the ones with the ribbons are SO cute! I have to get me those! oh wow! this are so lovely and elegant! presentation makes a big difference, i think it can make or break an event! All are so cute.. i wish i could get some of them for my wedding day. I really like the ones with the swirl stand! So pretty!